There's a debate raging in certain segments of social media about whether it's OK to punch Nazis in the face. This debate has been inspired by the punching-in-the-face of white supremacist Richard Spencer during an interview in Washington shortly after the Trump inauguration. Many of those who approve of Spencer's being punched in the face say that he deserved it, and that that, in and of itself, is sufficient justification. Given his support of a white nationalist agenda and complicity in endorsing "black genocide," it's easy to see how they could come to this conclusion. The man and his politics are not only despicable but also a potential public danger. Anti-punchers tend to be either stalwart defenders of free speech or people with strong non-violent or even pacifist commitments. I'm not sure that I have much new to add to the discussion. My opinion is pretty much rooted in a conventional ethical analysis of when the use force to resolve disputes is appropriate. The pro-puncher position does, though, pose a number of questions which, I feel, need to be addressed. First, who is it exactly who determines when advocating hateful ideas crosses the line, making the use of force justified? Is it a matter of how despicable the ideas themselves are? Or do they have to amount to a palpable threat, a so-called clear and present danger. And what proof is required before punches are thrown? A social media firestorm is a mix of facts and, as they say, alternative facts. Does this kind of evidence constitute actionable information? There's also the related question as to what measure of force is to be administered. A punch in the face can result in a superficial bruise that disappears in a few days or a broken jaw that may take months to heal or even the permanent loss of vision in an eye. Punches are hard to fine tune. And why stop at a punch? Why not a whack with a baseball bat or a slash across the face with a razor blade? Does the violence employed somehow scale with the gravity of the speech crime committed? Who makes this call? Also, what exactly is the objective of the use of force in these circumstances? 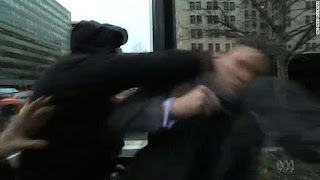 Is a punch in the face meant to be little more than a rebuke for saying vile and dangerous things? Or is it intended to strike fear in the speaker and deter future speech and actions? If history is any guide, the use of force against determined foes often does not have this effect. We imagine, at times, that if we hurt our enemies sufficiently then they will grow weary of the battle. This is the rationale behind terrorism. Finally, who is responsible if a punch in the face results in melee that spins out of control, injuring bystanders, including innocent ones? A single punch can quickly escalate into a fistfight, which, in turn, can lead to knives and other weapons being drawn as others are pulled into the fray. We are ethically accountable for the consequences of our actions that can be foreseen. How does the puncher explain to those injured or maimed in the aftermath of a punch that their suffering is justifiable? The words "collateral damage" somehow ring hollow. As I mentioned, my own ethical analysis of the punch-in-the-face conundrum is unremarkable: except in cases of self-defense and circumstances that demand immediate action lest great harm occur, I'm comfortable with delegating the use of force to the authorities. This approach is not without its flaws, but, of one thing I'm certain, predicating the use of force on the magnitude our personal outrage is a prescription for disaster. Questions like the ones posed above have to be answered if there is to be any ethical basis for punching someone in the face.